With Jurgen Klopp no doubt having one eye on the second leg of Liverpool’s Champions League quarter-final second-leg tie with Manchester City, the second Merseyside derby of the season wasn’t quite the spectacle supporters had hoped for. Sam Allardyce’s Everton held Liverpool, who had made five changes from the side that had beaten City 3-0 midweek, to an insipid goalless draw at Goodison Park. 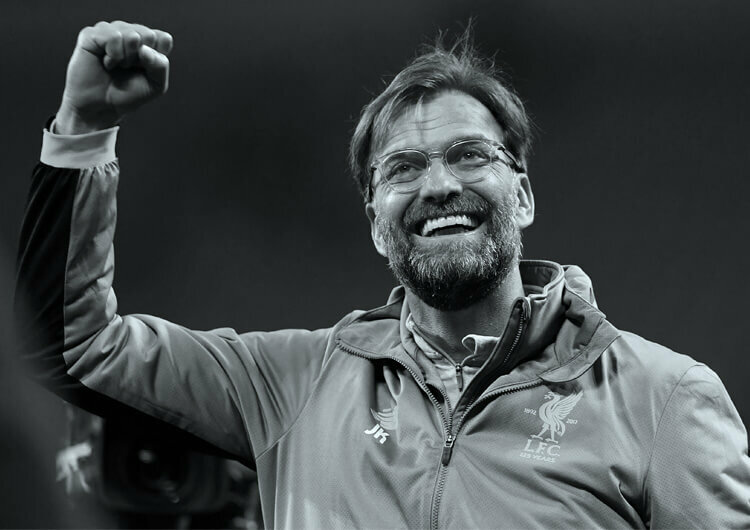 Klopp admitted after the game that Liverpool were fortunate to come away with a point against a Toffees team that could have claimed the three points in the closing stages of the contest. Here, our professional coaches analyse the tactics and key moments from the game. Everton began in a 4-3-3 shape, with Yannick Bolasie and Theo Walcott attacking in wide areas, looking to support the lone striker Cenk Tosun. Wayne Rooney, Tom Davies, and Morgan Schneiderlin formed the central midfield trio. Everton’s front three started very wide in an attempt to lure and isolate Liverpool’s full-backs into one-versus-one scenarios. 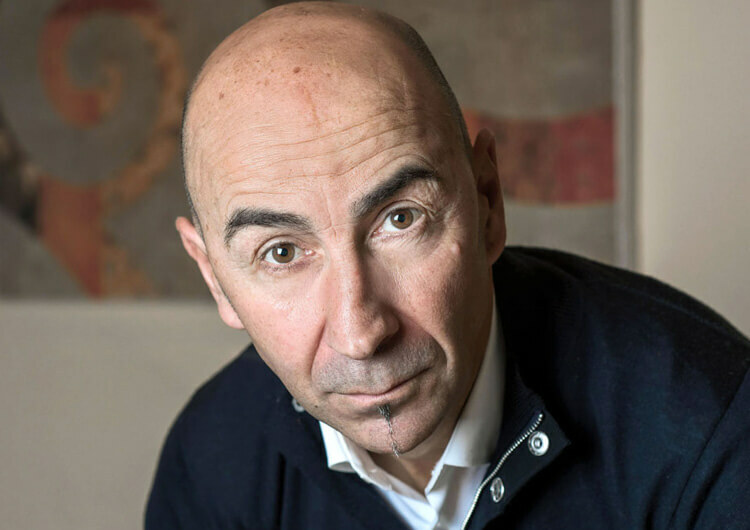 It was clear from the beginning, however, that the home side would have limited possession and their best chance to attack would come during the transitional moments. When out of possession, Bolasie and Walcott dropped notably deep to form a midfield block of five. 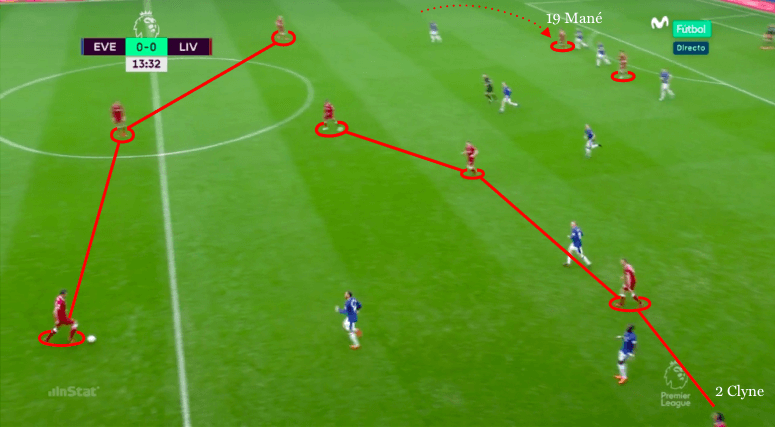 While this limited Liverpool’s attack, it also hindered Everton’s ability to transition quickly after regaining possession. 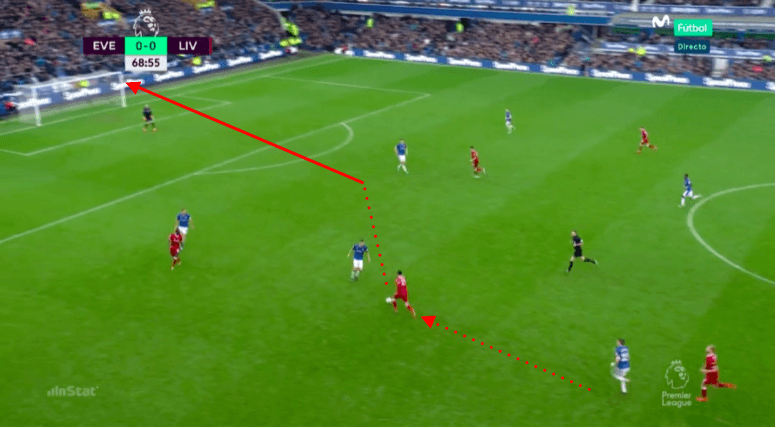 With Walcott and Bolasie required to make long recovery runs, they were positioned too far from Liverpool’s goal to carry a threat on the break. Noticing this, Everton concluded that early long balls into Cenk Tosun would be a more effective option. But with Liverpool forming a back three during their build, Tosun was left isolated and cut off during transitional moments. 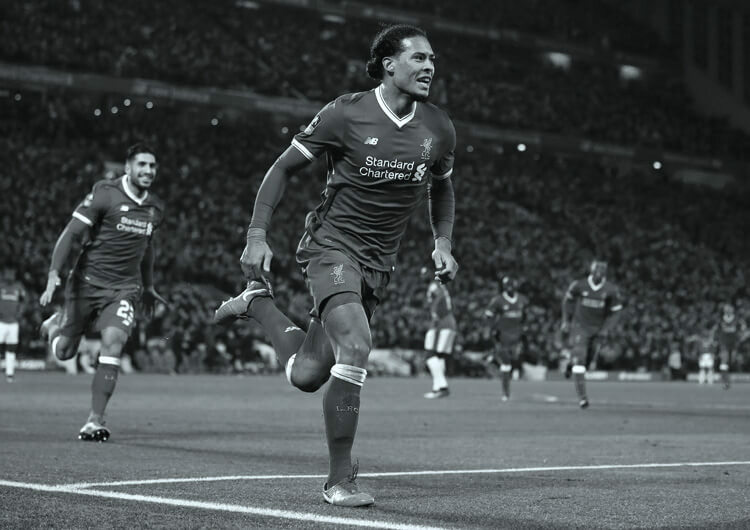 The Turkish striker tried to vary his movements – often drifting wider and taking up positions to split Liverpool centre-backs Virgil van Dijk and Dejan Lovren – but when he did win the first ball, which usually came long from goalkeeper Jordan Pickford, he lacked supporting runs from Walcott and Bolasie to pose any real threat. Liverpool occasionally performed a high press against Pickford, but it was unorganised and inconsistent. Pickford regularly had Michael Keane and Phil Jagielka as short options, with Morgan Schneiderlin also often dropping between the two. Despite his options, Pickford consistently played longer balls, which were limited in their success. 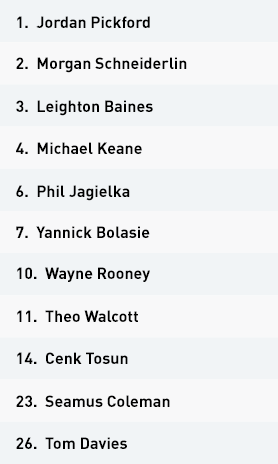 While Sam Allardyce made three substitutions in the second half, Everton’s tactical base remained. It was only when Liverpool made changes of their own that the home side found some success in penetrating their opponents’ back line. The introduction of Roberto Firmino, who replaced Sadio Mane on the left flank, gave Walcott an opportunity to isolate Ragnar Klavan on the Everton right. Walcott surged past Klavan, firing multiple crosses into the box, but his Everton teammates arrived too late, often mishitting or missing the ball altogether. With Firmino still failing to track back consistently, Seamus Coleman began to overlap Walcott, creating a two-versus-one on Klavan. Despite this overload, Everton couldn’t convert any of these late crosses from the right-hand side. Liverpool set up in a 4-5-1 when defending, with a central midfield trio protecting the back two centre-backs and inside channels. Danny Ings and Sadio Mane, who was later replaced by Roberto Firmino, covered Everton’s full-backs. Yannick Bolasie and Theo Walcott dropped very deep when Everton were out of possession, forming a midfield five. This was supported with a back four and a lone striker in Cenk Tosun, creating a 4-5-1 defensive structure. Liverpool converted into a back three in possession, as Nathaniel Clyne pushed forwards into midfield. The visitors formed a makeshift 3-4-3 in possession, and with Sadio Mane and Danny Ings moving inwards, Clyne and James Milner overlapped into wide crossing positions. With Danny Ings a natural centre forward, he would drift inside, often occupying Michael Keane at centre-back and Leighton Baines at left-back simultaneously. This created the space for Nathaniel Clyne to drive into. During the brief periods that Everton had possession, they elected to go long – even when there were short options available. Their success was limited, as Cenk Tosun, Everton’s lone striker, often found himself battling to win the first ball against two or three Liverpool defenders. 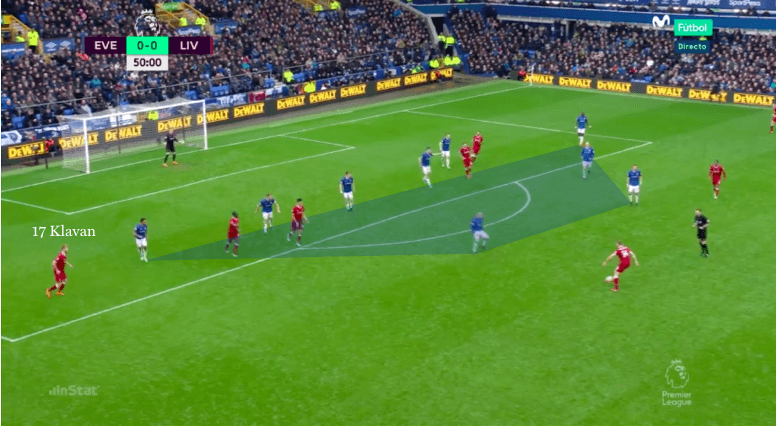 Everton’s most realistic chance to attack Liverpool was during the transition of possession. This, however, was made much harder with attacking players like Yannick Bolasie having to track Liverpool’s runners into deeper areas. Bolasie was often still recovering from a recovery run and too deep within his own half to mount a quick and successful counter-attack. The longer the game went on, the deeper and more compact Everton became. In response, Ragnar Klavan pushed higher, almost as an overlapping full-back. With Clyne on the right, Liverpool tried to horizontally stretch Everton’s back line, looking to create gaps to play through. Adding Alex Oxlade-Chamberlain to central midfield increased Liverpool’s attacking threat. Oxlade-Chamberlain, in contrast to James Milner, would receive possession and immediately drive at Everton’s midfield and defence. Liverpool had now become more dominant on the counter-attack. Ragnar Klavan stayed high and wide on the left for Liverpool. This stretched Everton’s back line, as gaps appeared between their full-backs and centre-backs. But with limited service, Dominic Solanke dropped deep out of frustration at not seeing the ball enough. Liverpool were left with no forward players to penetrate the gap made by Klavan’s positioning. With Roberto Firmino unaccustomed to tracking runners so deep, Everton had moments late on to exploit an isolated Ragnar Klavan at left-back. Theo Walcott had time and space to attack Klavan one versus one for the first time in the game. Seamus Coleman also began to provide overlapping runs, allowing Walcott to drive inside towards goal. 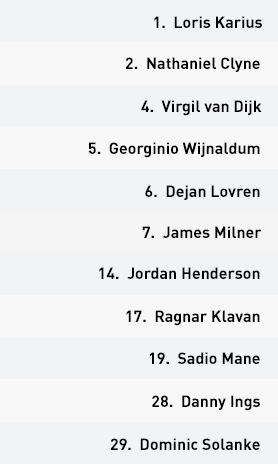 Liverpool set up with a 4-3-3 structure, with Dominic Solanke leading the attacking line, supported by Sadio Mane on the left and Danny Ings on the right. 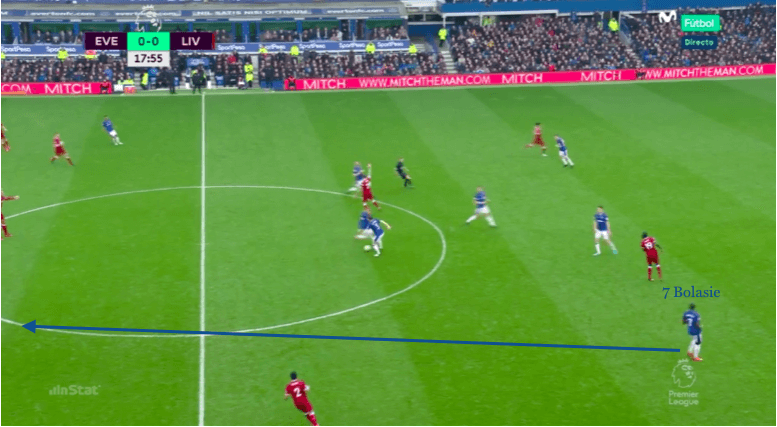 When defending, Liverpool switched to a 4-5-1 to match Everton’s midfield. It wasn’t long before Everton gave away possession through hopeful yet inaccurate long balls. 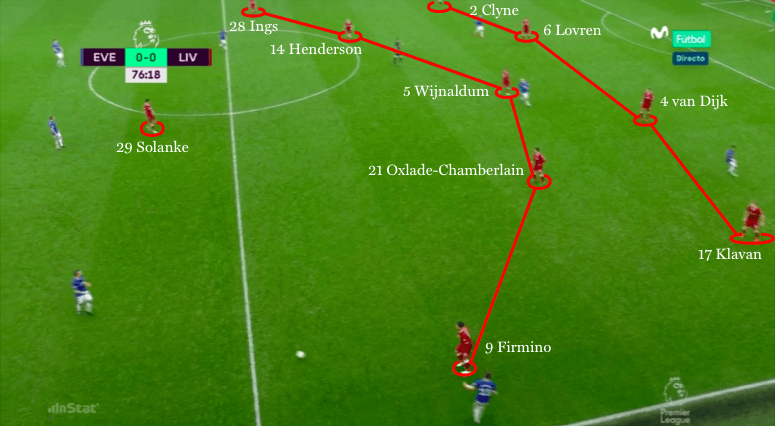 This allowed Liverpool to command the majority of the possession and transform into an attacking 3-4-3 formation. Nathaniel Clyne joined the midfield unit, providing width on the right side, while Mane provided width on the left side. Mane, though, frequently looked to drive infield, with and without the ball, which offered James Milner the overlapping run. Milner and Clyne regularly moved into good crossing positions, and Everton goalkeeper Jordan Pickford was forced to save a number of meaningful attempts on goal. 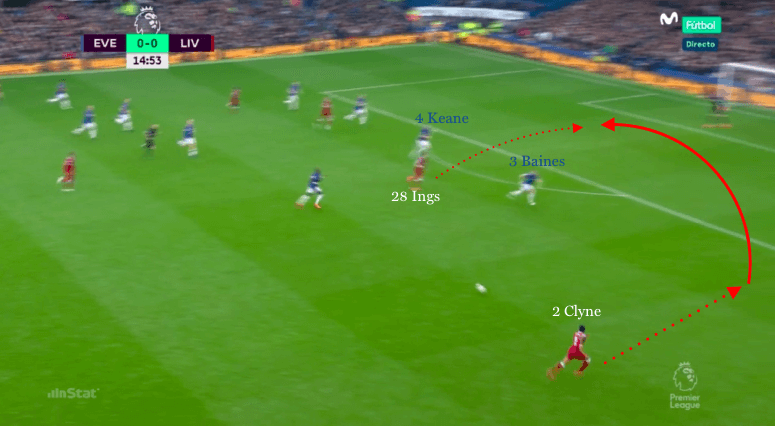 Ings played on the right of the front three, but as a natural centre forward, he drifted infield any time Liverpool had possession in Everton’s half. This created space for Clyne to overlap and deliver crosses into the box. With both Milner and Clyne overlapping in wide areas, Everton’s Yannick Bolasie and Theo Walcott were forced to make deep recovery runs. 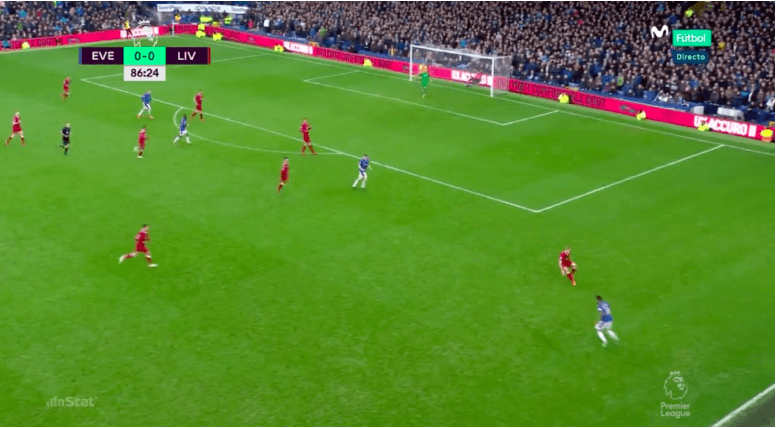 This not only enhanced Liverpool’s attack by dragging Everton’s two quickest and most direct players away from goal, but also weakened Everton’s potential counter-attack. Liverpool, at this stage, were in full control of the derby. 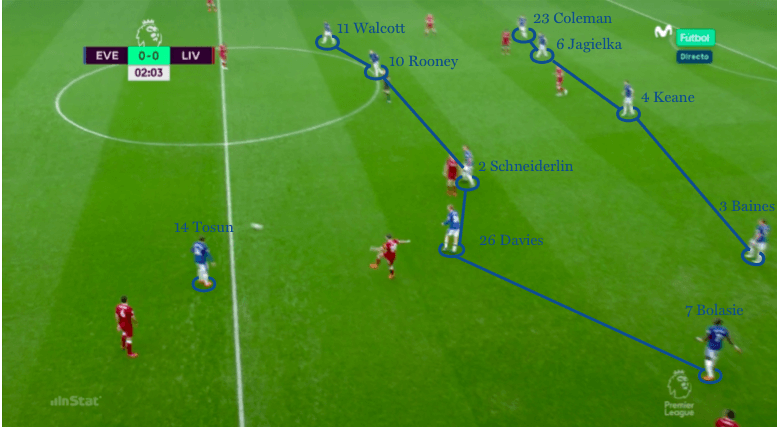 But despite dominating possession and the dynamics of the game, Liverpool couldn’t break down Everton’s block. Early in the second half, Everton dropped into a much deeper block, with Liverpool struggling to penetrate over or through them. Ragnar Klavan positioned himself much higher and wider, as Liverpool tried to horizontally stretch Everton’s back line. With Clyne on the right and Klavan stretching on the left, Milner could rejoin centrally as another attacking option. Milner was replaced by the more adventurous and direct Alex Oxlade-Chamberlain, whose impact in possession was immediate. Oxlade-Chamberlain drove at an Everton defence that until now only had to deal with patient build-up, rather than aggressive and direct approaches. Pickford was forced into additional saves as a result, but none that caused him any real alarm. The key battle involved Liverpool converting into a back three when building possession. James Milner and Nathaniel Clyne overlapped into wider areas, forcing Yannick Bolasie and Theo Walcott into deep recovery runs. Everton’s best chance of scoring was through a counter-attack, but with Walcott and Bolasie – the home side’s two quickest and most direct players – having to defend deep, Liverpool goalkeeper Loris Karius was unlikely to be tested. Despite Liverpool dominating the ball, they struggled to penetrate Everton’s defensive line. Inside movements from Sadio Mane and Danny Ings only congested the home side into an overcrowded central block. 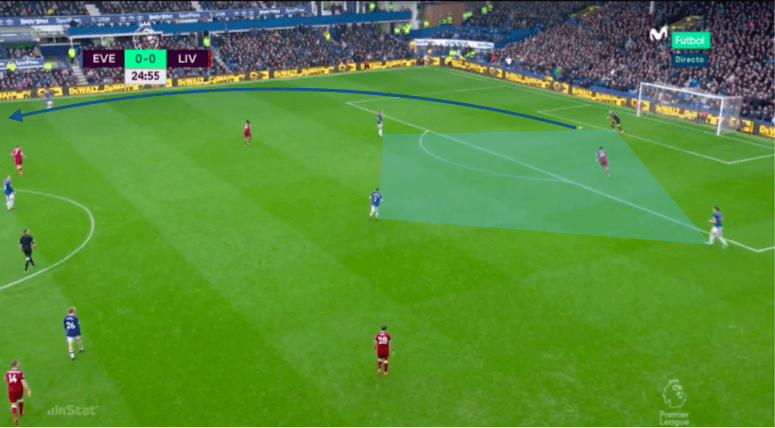 Liverpool were forced into attacking down either flank and crossing into the box, which was comfortably dealt with by Phil Jagielka and Michael Keane. It wasn’t until Ragnar Klavan stretched the left side that Liverpool began to penetrate in behind. The addition of Alex Oxlade-Chamberlain temporarily ignited Liverpool into second gear, but Dominic Solanke’s lack of forward movement negated Liverpool’s intensity. 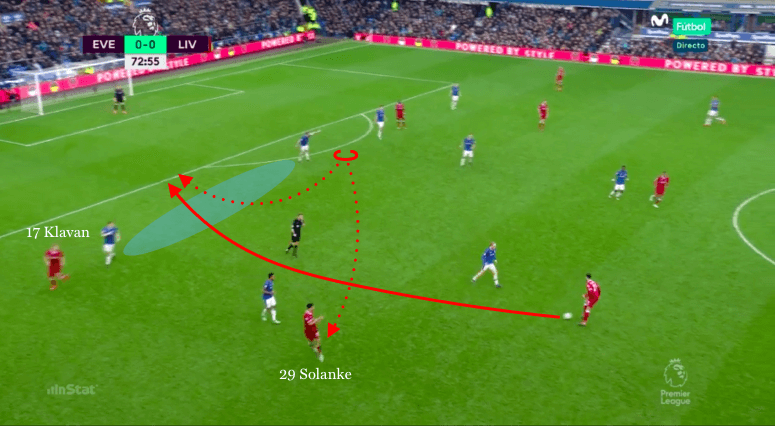 Out of frustration, Solanke often moved towards the ball, resulting in Liverpool having minimal penetration in the final third.